Spring has officially arrived! It’s time to dust off your garden tools and start growing some yummy veggies in the garden. There’s no place better to start than with peas. The best time to plant this garden favorite is about a month before you last frost date. This ensures an abundant and early harvest. What’s required to successfully grow peas? Not much. You’ll need a sunny patch of land in a section of the garden that’s well protected from gusts of wind. If you plant peas on the early side, they’ll do best in sandy loam soil. Raised beds are also helpful! A later planting calls for insulation from high temperatures, so heavier soil is ideal. You can mix and match with different varieties of peas. The four basic categories include shell peas, snow peas, soup peas and snap peas. Each has a different look and unique flavor. 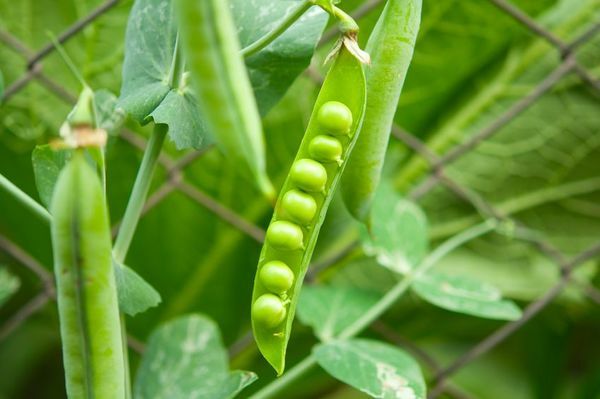 All four pea types come in both compact and long-vined varieties. Long-vined peas need some sort of trellis to bloom properly, usually one thatís about 5-6 feet high. Dwarf or compact peas can also benefit from a makeshift trellis. Try creating one from an old tomato cage or even by interspersing oats between peas to serve as natural support. Other plants that mesh well with peas include lettuce, spinach and radishes. Planting these beside your peas is a great way to ensure a beautiful and bountiful veggie harvest! Once you’ve decided the varieties you’d like to plant, here’s how to get your seeds in the ground & growing! Plant seeds about 1.5 inches deep, spread 2 inches apart. Long-vined varieties can be planted in double rows about 7 inches apart on opposite sides of a trellis. Thinning is not necessary. Peas don’t require much fertilizer, as they naturally produce nitrogen. Go for a balanced fertilizer, or no fertilizer at all if soil is already rich in organic matter. Never overwater peas-but make sure to keep them moist, especially during while they’re germinating, blooming, and when you notice pods start to swell. Before plants bloom, about 1/2 inch of water per week is deal. Afterwards, try for 1 inch a week. Your pods will be ready to harvest around 3 weeks after plants blossom! Pick your peas daily, ideally in the morning. Enjoy them as soon as possible! Peas begin to lose their sweet flavor even just a few hours after theyíre harvested.